The above handwritten document lists the contents of the Gemini 6A pilot's Personal Preference Kit (PPK). 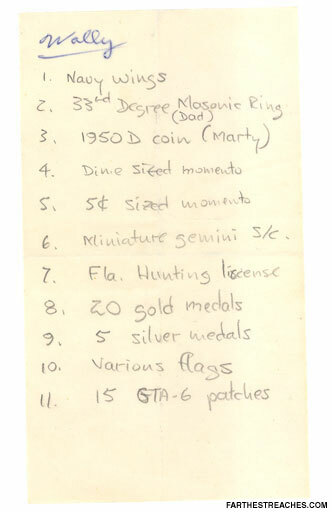 Walter "Wally" Schirra prepared this inventory and submitted it to fellow Mercury "original" and chief of the Astronaut Office Donald "Deke" Slayton, who then wrote Schirra's surname at its top. These items would have been packed and flown inside an approximate 6 by 7-inch gray nylon bag with a draw-string closure. The original manifest, as pictured above, was offered for sale in May 2006 through the site Farthest Reaches.